Two new arcade game items for you to enjoy this fine Monday morning. First, Sega Amusements has announced the release of their new videmption game Plants Vs. Zombies: The Last Stand. We’ve known about this one for quite a while and I got a chance to play it at Amusement Expo 2014 in March. For a videmption game, it is one of the deeper games I’ve seen in the category since it is not exactly a quick coin game – there are multiple levels and power-ups to grab and more went into it graphically than some other videmption games you can currently find. As a part of this release, Sega has this new promo video for the game which you can watch right here – it’s quite different than any other promo video I’ve seen Sega do for their Western arcade releases as it is like a TV commercial instead of just direct footage being shown. Speaking of new games, it was mentioned on AH not long ago that Bandai Namco was looking to bring their serious driving game Wangan Midnight Maximum Tune 4 to the US for some location testing. 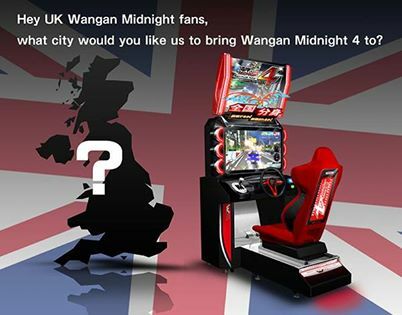 An effort had been started in the UK to petition Namco to test the game out there around the same time and while I do not know if that had any direct effect on it or not, the WMMT Facebook page is now asking which UK cities fans would like to see the game tested in. Of course this is the time for fans to show if they have any persuasive powers of the purse or not. It should be interesting to see how it all pans out; it is not a cheap game and it is very much skill based. The prevailing opinion is that drivers of this nature can’t compete compared to more casual driving games like Super Cars or Dead Heat, which have shown that they can earn pretty well over a long period depending on the location. For me I have a pair of converted Super Cars which are consistently in the #1 spot, topping my twin OutRun 2 and my single Batman on a weekly basis. I’ve never owned anything as technical as WMMT so I’m not sure how it would fare, although on rare occasion I’ve had someone ask about it or Initial D. I haven’t played any of the recent WMMT or ID games but I did get a chance to play a Taiwanese rival, Speed Driver 4 by IGS which to me as a gamer, I found it to be both enjoyable and memorable. That is easier said than done when the market has a lot of driving games to choose from.